From journalists’ sleepless wanderings in the Minsk palace to “buckets of coffee” served to the leaders, RT has gathered most interesting moments from behind the scenes of the epic all-night Ukraine peace negotiations. Never short of self-pity after waiting 16-hours journalists re-positioned themselves as the true victims of the Ukrainian conflict. Some consoled themselves with the assortment of delicacies and beverages, personally approved by former collective farm director, Aleksandr Lukashenko. While sleep took some, others took photos. Any exit from the talks rooms sparked ruction in the press pack. False alarms saw hacks rushing across the shiny palace floors to camera positions, only to realize that a president or foreign minister was taking a break. Angela Merkel caused the biggest false alarm of all, when she emerged with what was expected to be great news, but turned out Mrs Bundeskanzler needed a charger for her phone. One Russian reporter said that at one point the tense wait degenerated into a game of "Find the politician" as hordes of hacks, starved of any real news chased politicians through the corridors of the Independence Palace. At least one journalist, working for Interfax news agency, did have to be taken to hospital, after fainting from tiredness during the night. There was discipline, and indiscipline. After his ill-timed shout had stopped echoing around the massive hall the trouble-maker lost his accreditation. There was #barkinggate too. An incident between a Russian LifeNews reporter and Ukrainian journalists was caught on camera. The visibly annoyed LifeNews man unleashed an authentically terrifying bark at the reporters, after introducing himself. Palace security intervened. The LifeNews man apologized, reportedly, and was allowed to stay. Russian President Putin and Ukrainian President Poroshenko have already become known for their frosty handshakes (900k views on YouTube). This time the two leaders outdid themselves, exchanging a blink-and-you’ve-missed-it greeting that was nearly missed by the cameras. By contrast, the September handshake seems almost cordial. 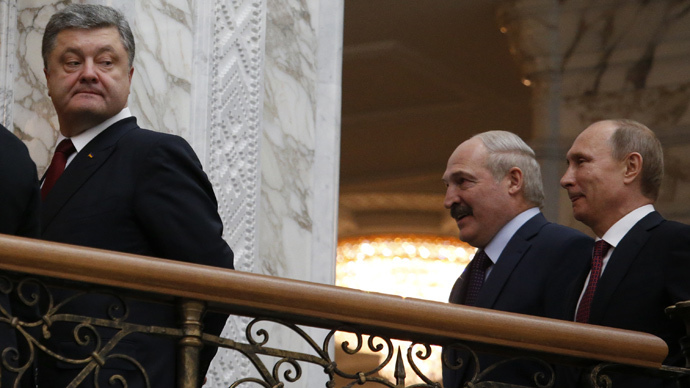 Perhaps the only leader with no obvious stake in the talks, was Belarusian president Aleksandr Lukashenko. But it was he who received hugs from both Putin and Poroshenko. Putin in particular, was photographed laughing heartily next to him, in contrast to the somber expressions seen elsewhere in the Independence Palace. Lukashenko did not sleep a wink and later joked that his task was “to provide supplies.” And not in a metaphorical sense. He later told the media that the leaders had the finest Russian and Belarusian "eggs, cheeses and dairy products, as well as buckets of coffee," which helped them stay up "without so much as a nap." "Just as in war, you need 'armaments' on the peace-making front. I was the one in charge of bringing up the armaments, and I did my duty as best I could," he told the media, pointing out that no one touched a single drop of alcohol, unlike the journalists. Lukashenko, who has said that he will run for his fifth term in office later this year, was also the subject of the most misleading viral video from the summit, in which he was shown pulling away a chair from behind Vladimir Putin. With the leaders tight-lipped, and the outcome in doubt right until the end, armchair analysts pounced on the image of Vladimir Putin holding a lime green pencil during the negotiations, which is seen snapped in half later on. Just what could that mean? The photo is being scotched as a fake. The most laid-back man at the summit appeared to be the Russian foreign minister Sergey Lavrov, who popped out for a cigarette several times. Lavrov’s quip to hacks on his way out for a puff that the talks were "better, than super” may be the quip of the summit. Finally, all the leaders emerged to give separate press conferences to their own media pools, with Merkel talking of a "glimmer of hope," and Poroshenko sounding most skeptical of all. Putin was first, summarizing 17 hours of talks in 7 minutes. "It was not the best night in my life. But the morning, I think, is good, because we have managed to agree on the main things despite all the difficulties of the negotiations."